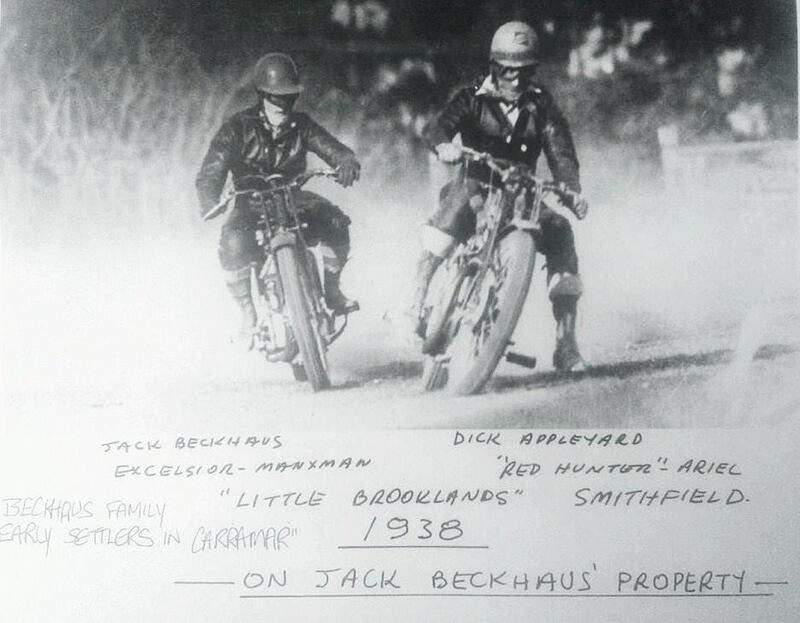 In 1934 a small group of motorcycle riders formed the Fairfield Motor Cycle Club, Phil Charlwood was one of those boys, along with others from the Smithfield and Fairfield area built the speedway on the Beckhaus property in Weatheril Park. It is possible that the track may have closed in the 1940's because of World War 2. 1938 Little Brooklands motorcycle action. Photo: Graham Bingham. One of the most famous riders to emerge from those days was a seventeen year old, Tony McAlpine who, although unsuccessful at speedway went on from dirt track to the big time in Europe and the Isle of Man. Fairfield Motor Cycle Club produced a few greats in the later years, John Dodds, Lee Atlee, Gordon Guasco and Jim Airey.